Plastic, wood or cardboard? In New Zealand as with the rest of the world, materials handling decisions impact on producers, exporters, retailers, consumers and the planet itself. By capitalising on global resources including an international network of sister companies, Viscount Plastics bulk purchases and holds in stock multi-trip (Return Transit Packaging – RTP) materials handling product. This not only makes crates, bins, trays and pallets readily available to customers, our prices successfully undermine perceived cost benefits of wood and cardboard. Replacing single trip cardboard cartons with plastic RTP, on average pays for itself after just 12 return trips (with a usable life of at least 92 return trips). But it is not price alone that is sounding the death knell for wood and cardboard . All pallets, wooden and plastic, carrying product to China, Korea, Japan, Canada, USA and countries of the EU must comply with ISPM 15 Certification. For wooden pallets this means heat treatment or fumigation. An additional cost that also carries the risk of delays and even rejection. Plastic pallets available from Viscount Plastics automatically comply with ISPM 15 Certification. In their quest to deliver higher quality while reducing handling and labour costs, supermarket chains worldwide are specifying the one crate or bin from the place of picking to point of purchase. This cannot be achieved with wood or single-use cardboard packaging. 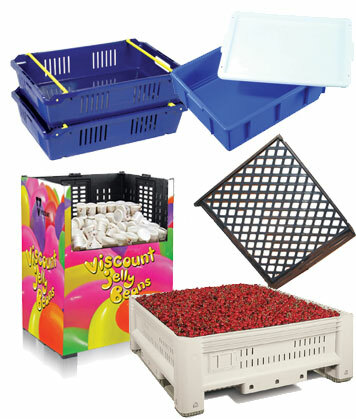 Viscount Plastics holds in stock crates and bins purpose-designed for field to shop floor. For practical and environmental reasons many fast food chains now only appoint suppliers prepared to supply meats, breads and other produce in returnable plastic trays. Here again Viscount Plastics has ready supplies of materials handling product approved by such international brands as KFC. Multi-use is a at core of environmental responsibility for plastic materials handling products. With advances in deep nesting for greater return empty efficiency and Viscount Plastics sourcing and bulk buying product, arguments for continued use of single-use cardboard packaging ring hollow. First of its kind research now proves RTP's product carbon footprint to be much smaller than one-trip cardboard cartons. Product carbon footprint (PCF) is a measurement of Greenhouse Gas emissions over a product's life cycle and its contribution to global warming. Independent studies have shown that RTP products hold a 70% more efficient carbon footprint than similar one way cardboard packaging. Whereas single-use cardboard and wood creates disposal issues, at the end of their service lives materials handling products from Viscount Plastics are recyclable as raw material for plastics manufacture. Viscount Plastics is a nationwide company with product delivery services to all parts of the country. Our specialised sales consultants are fully capable of evaluating your current materials handling and tabling recommendations. Chances are they'll save you money and at the same time show how you'll be doing your bit to save the planet.